The Raymond 1886 is a living example of Pasadena’s colorful past and carries on the city’s great traditions of craftsman architecture and unparalleled hospitality. 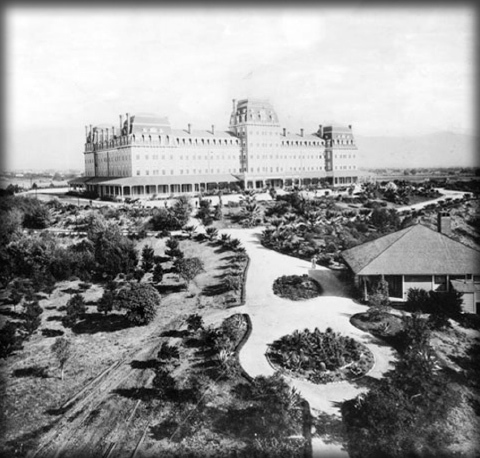 In 1886, Walter Raymond, a Boston native, came to Pasadena and built The Raymond Hotel – a fabulous sunny destination for Easterners looking to escape harsh winter weather. On Easter Sunday in 1895, sparks from a chimney ignited the roof and the entire hotel burned to the ground in only 40 minutes. Guests were directed to safety in the nearby cottage, and its said bartenders from the hotel’s “secret poolroom” were serving guests after the tragedy. Undaunted, Mr. Raymond built an even grander hotel with 300 rooms, along with a charming caretaker’s cottage. In the early years, Walter and his wife often stayed in the cottage when it wasn’t occupied by special guests. Gracious hosts, the Raymonds entertained celebrities such as Charlie Chaplin, Tom Mix, and Buster Keaton, who visited and filmed in Pasadena in the roaring 1920s. Sadly, in 1931, the Raymond Hotel was toppled by the Great Depression and the party was over. The hotel was razed to make room for residential development, and Walter and his wife moved into the cottage, where they lived until 1934. The caretaker’s cottage is now The Raymond | 1886, and the timeless charm and spirit of this lovely space can be enjoyed by all.